Melt butter in a large cast iron pan over low-medium heat. In a large bowl, whisk the eggs, yogurt, and vanilla until smooth. Add the sugar, salt, and nutmeg to egg mixture. Add flour and then carefully fold in blueberries. Pour batter into the cast iron pan. Bake at 425 degrees for 18 minutes, or on the stove (covered) at medium, mostly low-heat for 20 minutes. Because the oven still smelled a tinge like crayon wax, I chose to cook it on the stove and clean the oven instead. It worked great. Just keep an eye on the pancake and lower the heat to lowest setting once sides are browned, to avoid burning the crust. If the top needs a little more time, turn off heat and just keep the lid on a few more minutes. 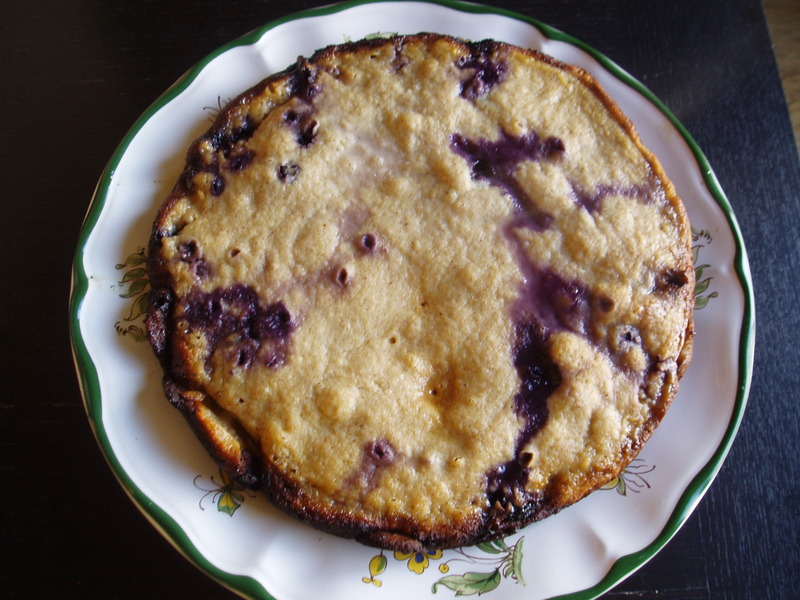 Oh, we LOVE German pancakes at our house – I’m going to totally have to try your recipe with yogurt in it! 🙂 Hi Amanda! let me know how it turns out!